In Sunday News, 6 February 1972, Johnny Devlin announced the arrival of his new Johnny Devlin Enterprises. It would, he said, include an agency, music publishing, a recording studio, gear hire and a record label. Devlin was, with his partner, sinking $10,000 of his own money into the venture. "We'll start off with local talent and then move international," the former rock and roll heartthrob predicted. The label was Kontact Records and the partner was Devlin's new manager Dave McKee, a successful promoter. In the New Zealand Herald two weeks later Devlin also announced plans to build a casino in South Auckland. The label was Kontact Records and the partner was Devlin's new manager Dave McKee, a successful promoter in New Zealand with strong contacts in the growing mainstream pub circuit. Over the next few months Kontact also signed Peter Posa (also announcing a role for the guitarist as the label's musical director), the TV star and singer Angela Ayers, rocker Tom Sharplin and Maria Dallas, fresh from her smash hit 'Pinocchio' on Viking. A distribution deal with EMI was also inked. 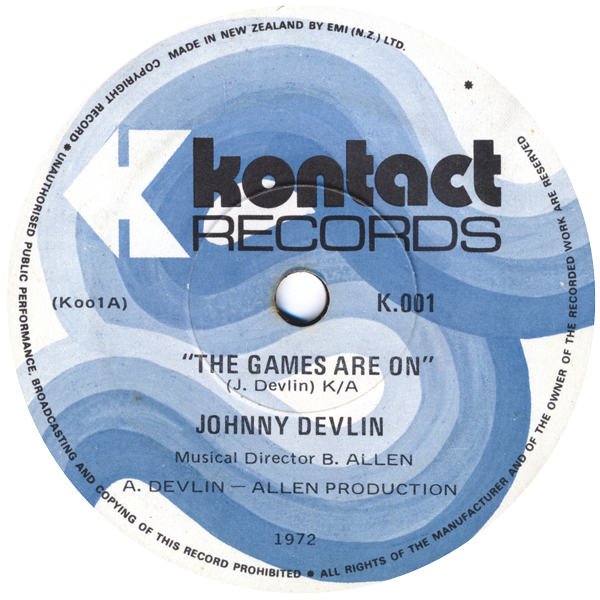 The debut single on the label (K001) was Devlin's somewhat wooden bagpipes-led pitch for the Commonwealth Games, 'The Games Are On', backed with his paean to his hometown 'The Wanganui River', both produced by Bernie Allen and released in May 1972. Neither was Devlin's finest moment and despite the publicity and the namechecks its sales were few. 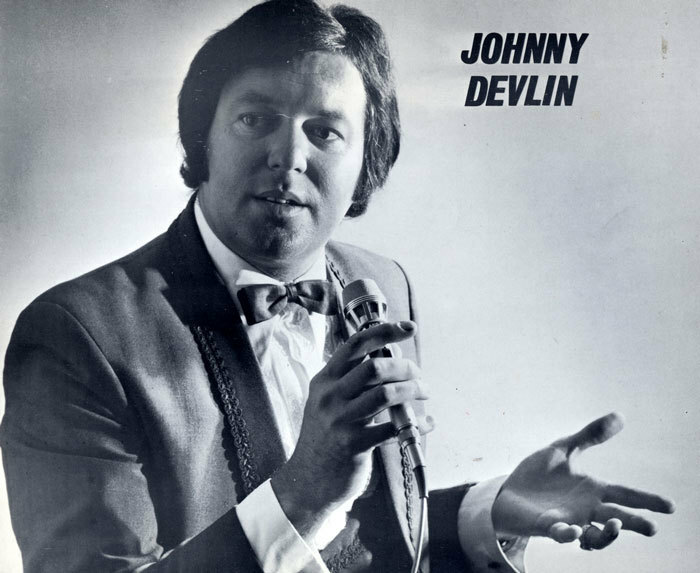 It was Devlin's only release on the label and indeed by the end of October 1972 he seems to have been gone from Kontact as the label was now noted on publicity and releases as being fully owned by McKee's Kontact Recording Co. Limited. 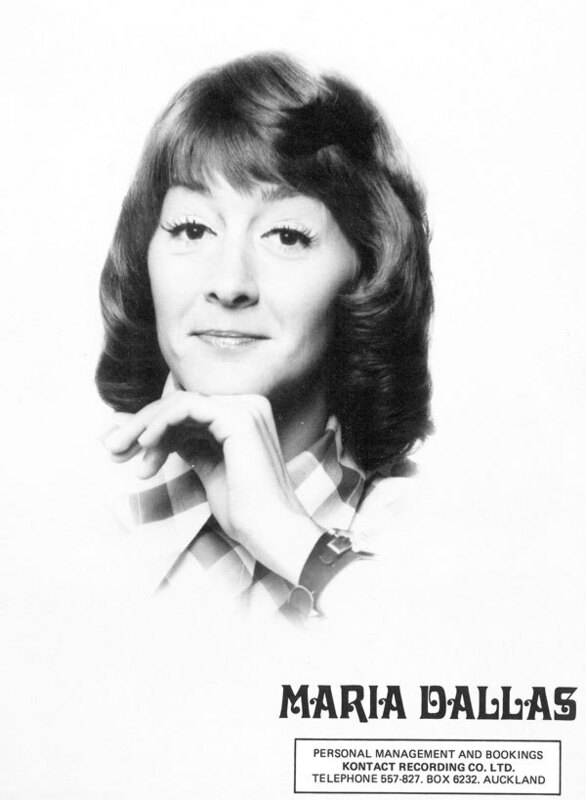 Whilst Peter Posa seems to have joined Devlin in the exit (without a release on Kontact), Maria Dallas released two singles for the label, 'I Love Your Kind Of Lovin'' in 1972 and 'You' for a briefly revived Kontact in 1981. The latter was her final New Zealand release. Other acts on Kontact were pub covers band Noazark, Robert Gennari, Hot Ash, Brent Brodie, Roger Skinner and Ritchie Pickett. 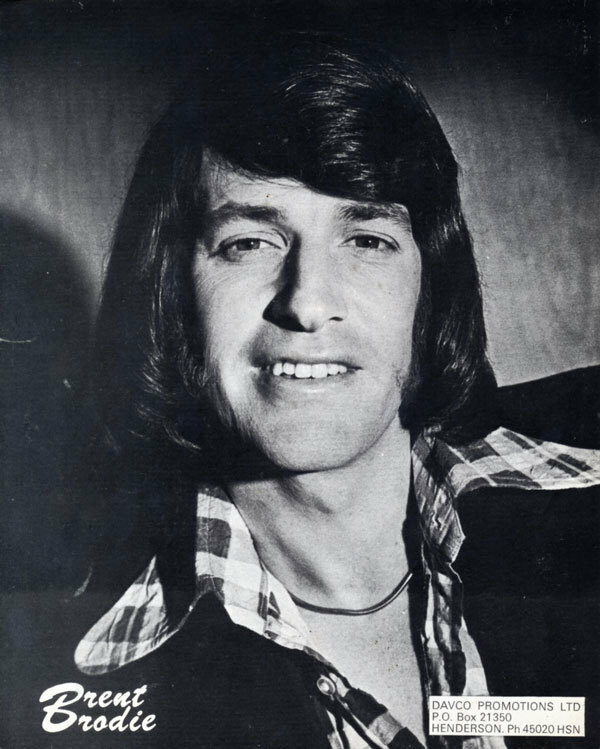 Fifteen singles were released on Kontact between 1972 and 1976, all via EMI, and another 10 between 1979 and 1982 under a new deal with RCA including a couple for Tauranga country singer Janice Ramage. Kontact Recording Co. Limited disappeared from the company register in 1988 and Dave McKee disappeared around the same time. The catalogue has long been unavailable. 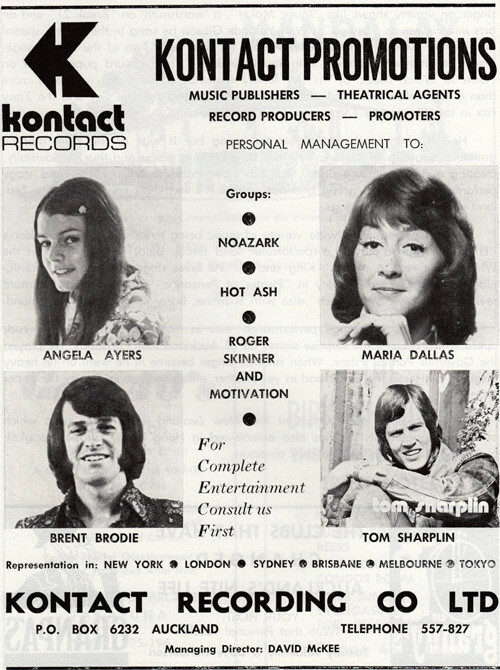 A Kontact advert listing their artists in the mid-1970s.